Scientist have found a thriving community of microbes living at the deepest known point on the surface of the Earth – a massive underwater canyon in the Pacific Ocean 6.8 miles below sea level. 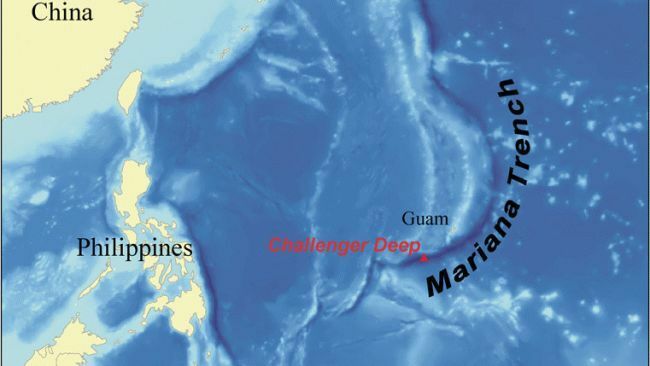 The bacteria were recovered from muddy sediments at a point underneath the central west Pacific called Challenger Deep in the huge Mariana Trench, a gigantic chasm in the seabed which is big enough and deep enough to swallow Mount Everest entirely. Marine biologists said they were astonished to find such an abundance of microbial life-forms living off the dead and decaying matter that sinks to the deepest parts of the ocean where pressures are more than a thousand times greater than at sea level. “These microbes may in fact be the ones that are the closest to the center of the Earth, the deepest living organisms that we have seen. They are probably the deepest observed community of microbes below sea level,” said Professor Ronnie Glud of the University of Southern Denmark. What’s living 5 miles below sea level? A deep-sea submersible robot that can analyse life-forms in situ discovered the microbial community in sediment samples taken in 2010 from the Mariana Trench. The sediment has built up over tens of thousands of years and is probably several hundreds of metres deep, Professor Glud said. “If we retrieve samples from the seabed to investigate them in the laboratory, many of the microorganisms that have adapted to life at these extreme conditions will die, due to the changes in temperature and pressure,” he said. “Therefore, we have developed instruments that can autonomously perform pre-programmed measuring routines directly on the seabed at the extreme pressure of the Mariana Trench….We find a world dominated by microbes that are adapted to function effectively at conditions highly inhospitable to most higher organisms,” he said. The scientists found 10 times as many microbes living in the sediment of the trench than in the surrounding abyssal plain of the Pacific seabed, which lies in relatively shallower depths. The discovery, detailed in a study published in the journal Nature Geoscience, is the latest in a string of finds showing that life can exist in some of the most extreme environments on Earth, from the dry, intensely cold regions of Antarctica to the hot springs and geysers of Iceland. Mark Lever of Aarhus University in Denmark announced last week in the journal Science that he had discovered microbial life-forms living on the chemical energy trapped in volcanic rocks at the bottom of the sea – the first time microbes were found living deep inside the Earth’s oceanic crust.